DHADING, Feb 21: Sujata Bishwokarma had never seen computer before except in pictures. When she entered the computer lab of her school recently, the seventh-grader at Shami Bhanjyang Secondary School of Jywalamukhi Rural Municipality in Dhading, she could not believe her eyes. She felt elated and proud. “Computers in school mean that we will learn to operate them. Before that we had seen only pictures of computers in our textbooks,” she said. “There are many computers in our lab now and we are happy about it,” she added. Most of the students at Bishwokarma's school come from families with poor financial background. Well-to-do families hardly send their kids to this community school. “There are many children in my locality, who go to private schools. They are used to operate computers. In our school, we never saw one,” she said. Though the school had not been able to afford a real computer, it had nevertheless introduced computer education to children. Bishwokarma has also learned some basics of operating a computer, though that was only in theories. Since she had not seen a computer, it was always difficult for her to relate the theory into practice, she says. “We used to learn about computers in our computer class. Though our computer used to try to explain how a computer worked, I was never able to understand well,” said Bishwokarma. However, that was the case until some former students of the school got together for setting up an e-library for the school. They raised funds for the financing the initiative. The school now has an e-library that the students use to learn. Another community school in the same area - Thulochaur Secondary School -is also equipped with e-library and computer lab now. Even it also received the computers as a gift from its former students. Each of these schools' e-library is equipped with 30 computers, printers, projectors and other tools required to run the library. According to the school administrations, the total cost for this has reached Rs 1.6million. “Some of us who are former students were eager to set up e-library at the school. When we reached out to our former classmates for help, they were also equally enthusiastic about it. It is indeed a pleasure to be of help to the school where you studied,” said Basanta Khadka, an engineer with the E-library Foundation. “To make the initiative more effective, we also trained teachers at the school for operating all the equipments. Now, they will handle everything properly,” he added. Khadka himself had trained the teachers for a week. Some of the students also joined in the training. “I was one of the students to attend the computer class. We learnt a lot about the use of computers and e-library. Still, lot remains to learn,” Bishwokarma said. 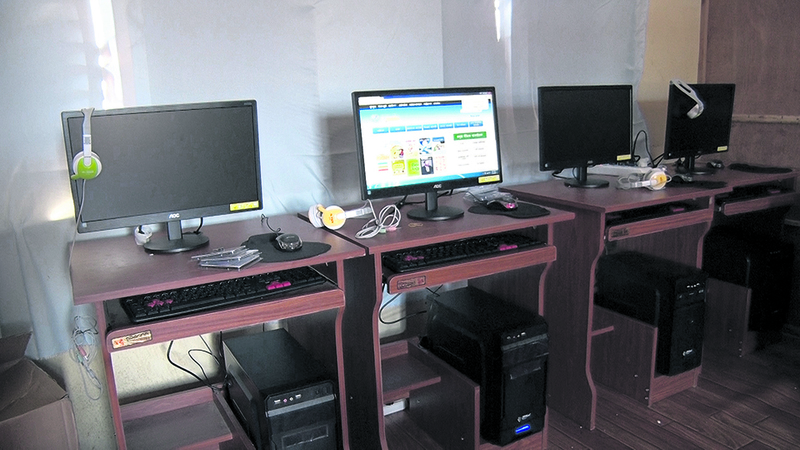 Installation of computers and access to e-library has filled the students with joy and confidence. They state that they feel 'equal' to those studying in private schools. “Or else, we would feel low. We used to think that we have no access to the most important thing of today's world - computer,” Bishwokarma said. She insisted that all government schools, in fact, should have computers. Arrival of computers in the schools has excited teachers as well. 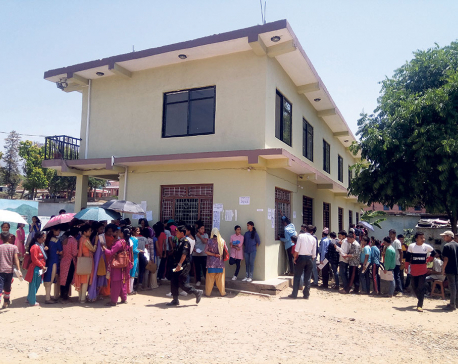 According to Samjhana Shrestha, lower secondary level teacher at Shami Bhanjhyang School, government schools are devoid of computer facilities. “There are many schools which are struggling for survival. Many are on the verge of closure due to several reasons. Amid this, the dream of having e-lab or computers is not possible for them,” she explained. “But when we don't have such facilities in school, we cannot give that knowledge to children. We, teachers also remain far behind than the teachers of private school. This is not good,” she added. Shrestha reported that the change in her school following the lab has been huge. It had a great impact on the entire environment of the school. “We all feel so good as if we have gone modern and skilled,” she stated. As per the curriculum, computer studies for students start sixth or seventh grade. But, the government has been able to provide computers to all schools. While resourceful schools manage to have it, many schools run without such facilities. According to Shrestha, few schools in Dhading have computer and internet facilities. “In this age of technology, our children are deprived of computer knowledge. This affects their growth,” she added. According to Bal Krishna Shrestha, who is a former student of Tholochaur Secondary School, students' craze for books is a great thing. E-library allows people to study books from around the world even without the help of internet. “So, e-library is the best window to the world and children here getting used to it is a huge matter of pleasure,” Shrestha said.